Dan in a pod ... 🎙 Axios Pro Rata Podcast launches tomorrow. Subscribe to Dan Primack’s 10-minute podcast here to get smarter, faster on the collision of tech, business, and politics. World leaders are learning to play President Trump using his own set of predictable negotiating tricks. 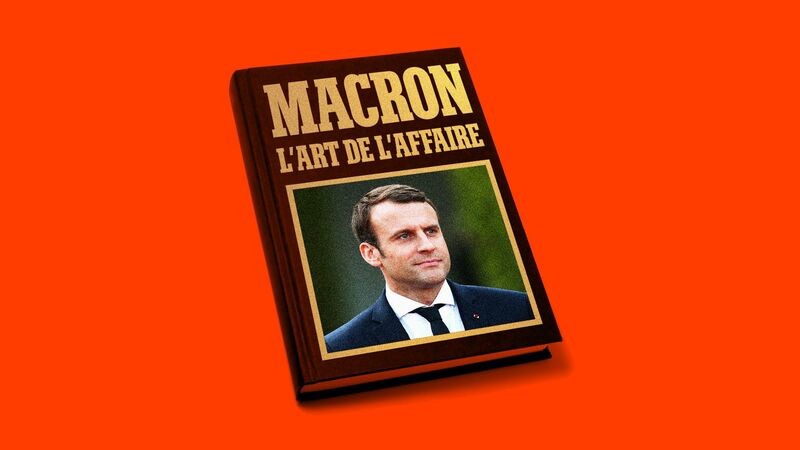 The most vivid example of this: French President Emmanuel Macron bragging to Trump that he was jamming him by stealing "The Art of the Deal" techniques, Axios has learned. The scene: Perched on white leather armchairs in their bilateral meeting on the sidelines of the NATO Summit in Brussels, Trump and Macron soon turned to the unavoidable subject: The expanding trade war between the United States and Europe. Trump, after whacking the Europeans with steel and aluminum tariffs, has been frustrated by the European Union's retribution. The Europeans have designed tariffs with the goal of inflicting as much political pain as possible on Trump. They targeted Kentucky's bourbon industry, Harley Davidson motorcycles and America's iconic Levi brand jeans. During their tête-à-tête, Trump suggested to Macron that he tell the European Union they ought to negotiate with the U.S., according to a source familiar with the conversation. Macron replied that no, actually he was not in favor of negotiating under threat. "I read the Art of the Deal," the French president told Trump, with a smile. "I know that we need to retaliate first so we have some leverage in the negotiation." What we're hearing: A senior Trump administration official told me another story that illuminates this part of Trump's mindset. As we know, Trump was glued to the television as former FBI director James Comey testified before Congress on March 20 of 2017. Trump would never admit this publicly, but he told people afterwards that he was impressed by the performance of his Democratic nemesis Adam Schiff. Trump hates Schiff and calls him a horrible liar. But he marveled at Schiff's tough and surgical opening statement that day. More than six months after the hearing, Trump told an aide how impressive he considered Schiff's performance to be. "This is like September or October last year," a source who discussed the matter with Trump recalled. "Trump was like, 'I watched that [Schiff's statement] and thought I had committed a crime!'" "He has respect for the adversaries that have the balls to take it to him like he takes it to them," the source added. The Chinese have absorbed this lesson the best. They have engaged in a trade war with no armistice in sight. Trump has threatened the Chinese with tariffs on more than $500 billion of Chinese imports; but, as we've reported, he's playing a dangerous game. China is fully prepared to retaliate and out-wait America. The bottom line: President Xi is playing Trump's game with a much better political hand. The Chinese leader enjoys the advantages of authoritarianism — "president for life" as Trump admiringly calls him. Unlike Trump, Xi doesn't have to worry about annoying obstacles like Congress and elections. And while a trade war would hurt both nations badly — as my colleagues have written — a state-run government can do more to artificially prop up its economy than a capitalistic one. In the early evening of July 9th, Donald Trump stood in the gold draped East Room of the White House with a small group of senior advisers to rehearse his announcement of Judge Brett Kavanaugh as his nominee for the Supreme Court. What we're hearing: Trump has been frustrated that some of his previous appearances on camera have not had the production values of the prime time TV shows he spends so much time watching. Trump frequently complains to aides about the "terrible lighting," sources who've been in the room for his outbursts have told me. Now, instead of taking his grievances out on his chief of staff John Kelly, Trump has his own in-house TV producer to consult. Yes, but: As a senior administration official pointed out to me, Shine's official role is much larger than being a high-end TV producer. He oversees the entire White House press and communications operations. "And if ever there was a week when [Trump's concern] went from 'how does it look' to 'how does it sound', it was this one," the official told me, referring to the attempted clean-up after Helsinki. 4. Behind the podium: "He wanted me to repeat his answers verbatim"
"[B]etween 10:00 a.m. and noon, Sarah Huckabee Sanders and I would poke our heads into the Oval Office ... [Trump] was always full of questions, wanting background on where a story came from and, of course, curious to know what we were going to say about it. And he was never shy about giving us directions." "I'd be peppered throughout the day with calls from the president as stories evolved. He was extremely engaged, very particular, and insistent about how he wanted his points delivered." "The more time I spent with him, the more I came to understand that President Trump wanted me to repeat his answers to the press verbatim." Spicer: "Sir, just a reminder about the St. Patrick's Day event tomorrow — do you have a green tie?" Trump: "Yeah! Of course I have a green tie." A long pause. "Well, I have one in New York, but I don't have one here." Spicer: "I've got an extra green tie. Would you like me to bring it in?" Trump: "Thanks, sure, but let me see what I can do. It'd be great to have a backup in case I can't find one. Let's touch base in the morning." "First thing that day, I delivered the green tie to the Oval Office and set it on the Resolute desk.. ... The billionaire president wore my green tie that entire day ... He must have liked it because I've never seen that tie again." "Before I walked out, I would try and have a moment of reflection and read a daily passage from the book Jesus Calling." "Behind my desk was a wooden table with two drawers. On top of the table sat a box with a picture of St. Gabriel on if that [my wife] Rebecca had given me as a gift when I took the job. In the box, I had two medals that I would slip into my pocket: one of St. Michael in honor of my dad and another of Mother Teresa ... given to me early in my tenure by John Gizzi of Newsmax." Why this matters: JCN was the most powerful outside group that helped confirm Trump's first justice, Neil Gorsuch. The group, which can legally protect its donors' anonymity, spent millions flooding the airwaves on Gorsuch's behalf. The House will consider a series of health care bills, which Republican members hope will give them something positive to tell voters about one of their most vulnerable issues in November's midterm elections. The bills being considered, per a Republican leadership source: the Protect Medical Innovation Act, which would permanently repeal the medical device tax; the Increasing Access to Lower Premium Plans and Expanding Health Savings Accounts Act; and the Restoring Access to Medication and Modernizing Health Savings Accounts Act. The Senate will vote on Monday night to confirm Robert Wilkie as Trump's new secretary of the Department of Veterans Affairs. Then the Senate will begin considering the next package of spending bills. The package will fund the Department of the Interior and FSGG (financial services / general government), and may add funding for the departments of Agriculture, Transportation, and Housing and Urban Development, according to a leadership source. Monday: Trump hosts the "Made in America Product Showcase." Tuesday: Trump delivers remarks at the Veterans of Foreign Wars of the United States National Convention. Trump also participates in a roundtable with supporters. Wednesday: Trump meets with the Secretary of State Mike Pompeo, has lunch with Pompeo and the Secretary of Homeland Security Kirstjen Nielsen. Trump also meets with the President of the European Commission, Jean-Claude Juncker. Thursday: Hold for presidential travel to Dubuque, Iowa, and Granite City, Illinois. Jason Miller was excited. The legendary college basketball coach Bobby Knight was visiting Trump Tower and the campaign's senior communications adviser thought it would be a great opportunity to get Knight in front of the beleaguered Trump team for one of the coach's inspirational halftime speeches. Behind the scenes: About 30 Trump communications staff and volunteers were gathered in the war room. Cable news blared on eight TVs that never switched off. Miller came out of his office to give the team a rare "ra ra speech," a "let's go get 'em speech... let's fight hard today and here's what we're pushing," according to two sources who were in the room for the occasion. "Jason says, 'We've got Coach Knight here, the legendary Coach Knight. Coach, why don't you say a few words to the team here'," one of the sources recalled. "Sure, sure. Happy to, Jason," Knight replied, in the recollection of the source. "You know, I love Donald Trump. He's a great man. He's gonna be a great president. I'm confident that he's gonna win. "But really the one thing, the one thing I just can't understand is... Well, he's just got to stop talking about this f---ing wall." Knight kept going, attacking the centerpiece of the Trump campaign, as Miller stood by agog and staff tried to suppress their laughter. "I go everywhere," Knight said, "all over the country. And people tell me 'Donald Trump is awesome but I don't understand the wall.'" "I'm telling you," Knight continued, "people don't understand the wall and you've got to stop talking about the wall. Trump's gonna win. But you've got to stop talking about the wall." "So go get 'em guys." Miller appeared befuddled. "Jason was like, 'Uh, thanks for that coach. Alright everybody, let's get back to work,'" the source recalled. Then everybody returned to their desks for another day in an office that often resembled The Office.